MikuMikuDance Artists, MMDers, Experienced and Noobs, alike, can write about their passions on LearnMMD.com! Almost 800 MMDers a day get their start by downloading the MMD program zip from LearnMMD.com or by following the links to the VPVP page. 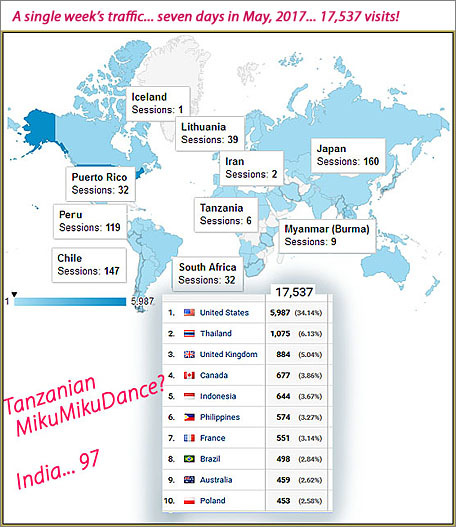 That’s 800 new users a day who experience the awe, mystery, and initial frustration of MikuMikuDance … and they got their start right here, at LearnMMD.com! LearnMMD is the perfect starting place for the new MMD enthusiast. We offer simple “Getting Started” instructions and plenty of “how to” and “where to find” information … ALL WRITTEN by enthusiastic MMDers, like you! who want to share what they know. get their start at LearnMMD.com! Experienced users will find plenty of interesting articles here, too! It’s always fun to read someone else’s experiences with things you haven’t tried yet … or maybe the things you have already suffered through on your own! Share – Teach – Brag! Write It down as a Contributing Author on LearnMMD.com! Every MMDer wants to share what they have learned … wants to tell someone. Write it down here … in the pages of LearnMMD.com. Over 17,000 readers visit our site every week … almost 70,000 people a month … and over 45% are returning visitors coming back to read some more! They want to read what you want to write … it’s a perfect circle. Our readers come from around the globe! Click the button, here, to visit the “New Authors” page. It’s easy to get started and you will get plenty of help from Reggie Dentmore, the Editor and Founder of LearnMMD.com. It’s Easy … It’s Fun … When you get your login, you will get a personal “Welcome” email from Reggie. You’ll also get our weekly newsletter via email that lets you know all about the inner workings of LearnMMD.com … Where we are going, what our readers are saying, and what’s coming next. There is no pressure … it is all just for fun … get a login, see what you are missing!